Blogger is an excellent platform for publishing blogs, and it is easy to an email for to your blog.The following tutorial covers step-by-step instuctions for adding a contact form to your blogger website. Blogger allows you to choose to either add your form to an individual blog post or you can add it as a Gadget featured on every page of your blog. Both of these options are outlined below. 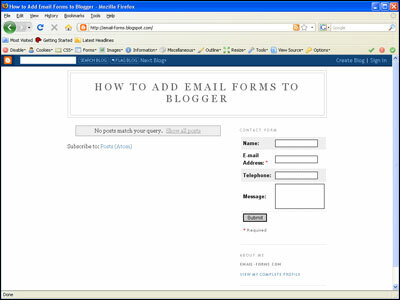 A fully functioning demonstration form hosted on Blogger can be seen here. The first step in integrating an email form into your website is to build the actual HTML code for the form. The easiest and quickest way to create the form code is to use myContactForm.com a free email form service. 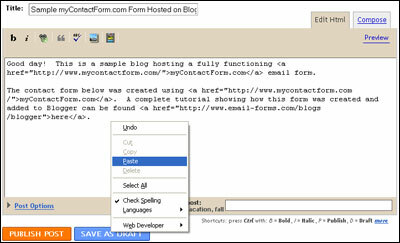 Click Here to read a tutorial on creating the form HTML using myContactForm.com. a. 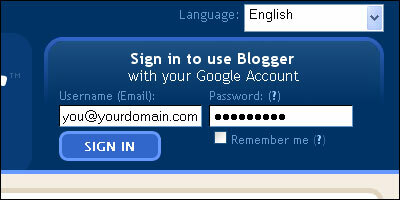 Go to Blogger.com and enter your account login. a. Write your new post as you would normally do in Blogger. When you come to the point where you would like to insert your email form, click the Edit HTML Tab. b. Identify where if the post you would like the form, paste the form HTML code (Edit > Paste, or CTRL+V, or Right Click and Select Paste). If you do not have your form code created and copied, please read this tutorial to learn how to do so. c. Once you have pasted your code, you will need to make a few changes manually in order to ensure that Blogger formats it correctly. 1. Get rid of any new lines (hard returns) that are within the HTML code. When Blogger goes to publish the post, it will interpret these as new lines and replace them with line breaks <br>, adding excessive white space to your form. 2. Make sure the elements of your form work with the template layout for your blog. I've found that making the form too wide or individual question fields too wide will often break the form. You may need to experiment with your form in order to ensure it works with the layout. We have created a sample Blogger form which can be seen here. The first step in getting a contact form on your site is to build the actual HTML code for the form. The easiest and quickest way to create the form code is to use myContactForm.com, an easy to use pieve of contact form software. 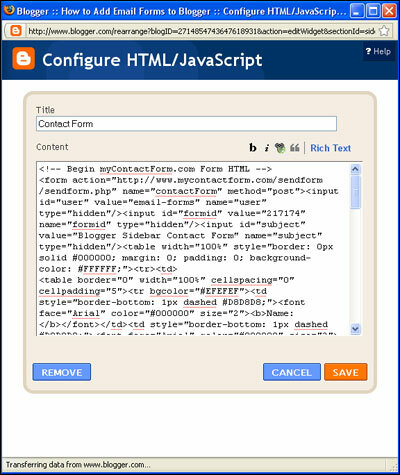 Please read this tutorial on creating the form HTML using myContactForm.com. a. Go to Blogger.com and login to your account. (Edit > Paste, or CTRL+V, or Right Click and Select Paste). If you do not have your form code created and copied, please read this tutorial to learn how to do so. e. Once you have pasted your code, you will need to make a few changes manually in order to ensure that Blogger formats it correctly. 2. Make sure the elements of your form work with the template layout for your blog. I've found that making the form too wide or individual question fields too wide will ofter break the form. You may need to experiment with your form in order to ensure it works with the layout. Generally a 95% wide form works well. e. Your new Email Form Gadget will now appear in your blog's right column.